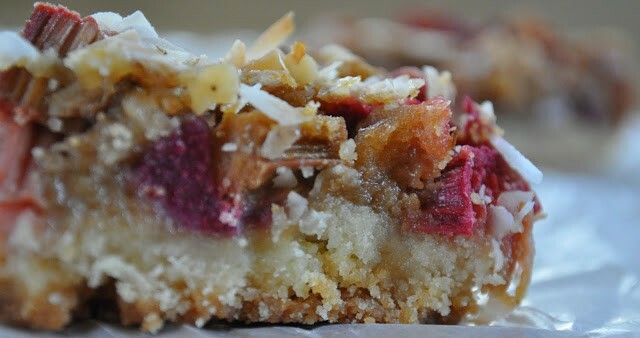 Rhubarb Dream Bars, no dream just real life in the land of abundant rhubarb. If you’re looking for a way to use up that rhubarb out of your garden these use 4 WHOLE cups of rhubarb. 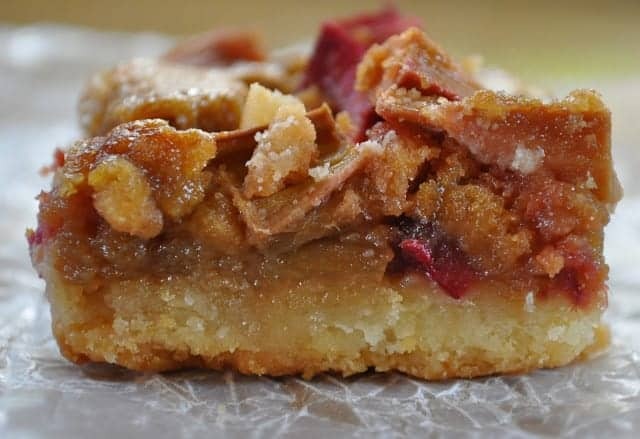 And Rhubarb Dream Bars with their shortbread crust, and that top layer with just a delicate bit of a crust that gives way to a gooey layer of almost custard are quite a delight to eat, or give, or eat. 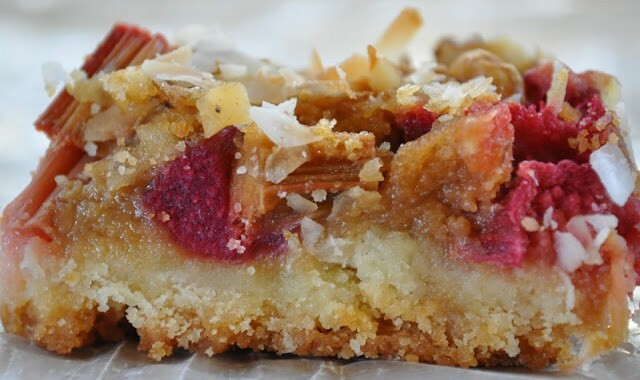 Whatever you do just make Rhubarb Dream Bars and bring me some, ok? Last week a friend came over looked at my rhubarb patch and said “you better use that rhubarb up!” and the funny thing was I HAD been using it! I’d been cranking out crisps, rhubarb soda, Crock Pot Cobblers, Rhubarb Bars, Strawberry Rhubarb Bars, and Rhubarb Juice, yet it still looked like I hadn’t touched it. So in a fit of USE IT OR LOSE I decide to USE IT. I went at my patch with a vengeance and after going through a 1/4 of it I had 10 quarts in the freezer for winter use and a nice big batch of these dream bars. While I was at it, I took out all the under stalks and cleaned it all up and it looks so sad and barren but never mind my freezer is bulging full of rhubarb. And I have so much more to go! We are going to be eating so much rhubarb this winter. I did leave several stalks on each plant though so it does have a way to regenerate and come back nice and healthy for another harvest this summer, what-am-I-even-saying?!? Oh well, I had someone suggest I bring to the new Palmer Food Swap and I might just go for it. 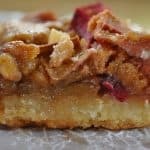 Rhubarb Dream Bars, no dream just real life in the land of abundant rhubarb. If you're looking for a way to use up that rhubarb out of your garden these use 4 WHOLE cups of rhubarb.  Do you live in the Palmer area? You should come to the Palmer Food Swap, (and bring these!) it’s doing to be great fun! Those look really good. 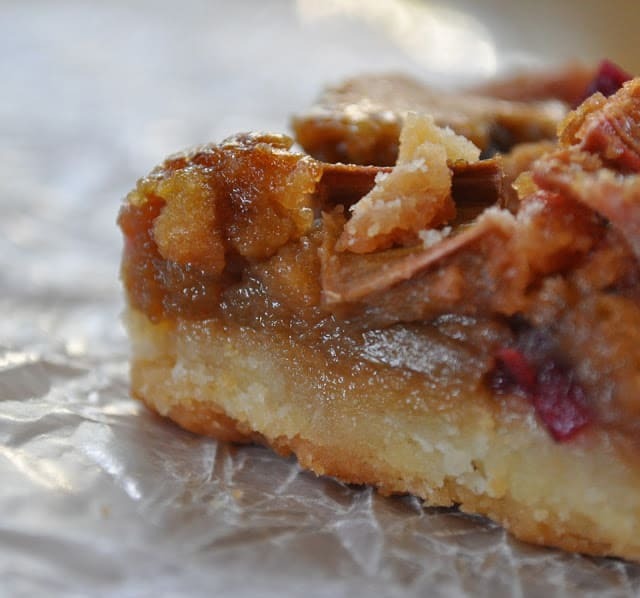 I love shortbread and love rhubarb. Making this now, but usingthe tart apples my kids picked from the orchard instead of rhubarb. They are in the oven now, and the house smells divine. Thanks for the recipe–cant wait to try it! Oh yes for rhubarb…I can never get enough of it!!! These are definitely dreamy! Pinned! This looks and sounds delicious- I have a brown-thumb so far, but all this talk of bountiful harvests make me want to try to grow something! !